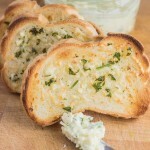 Ever wanted your own garlic butter spread recipe for making garlic bread at home? Well, now's your chance! This one is easy, quick, and keeps in the fridge! Spread the butter on the loaf or bread slices and wrap in foil. Bake for 8-10 minutes. Remove foil and bake an additional 3-5 minutes.